RajGuru Pandit Raj Kumar Sharma born in a very religious and intellectual family. He has been studying the science of astrology as a hobby right from childhood as the knowledge of astrology has been flowing through heredity in his family. 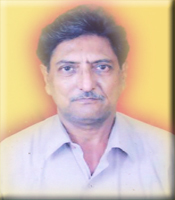 He took formal education in astrology from 'Institute of Astrology', Varanasi as "Jyotish Devagya" a highest degree in astrology. He is a highest devotee of Mata Bagulamukhi. He did 10 years of 'Occult Bagulamukhi Tantra Sadhana' in ancient Bagulamukhi Mandir made by maharaja Vikramaditya in Nurpur, Himachal Pradesh under guidance of his guru ji late Swami Sarvanand in a strict discipline. He is a RajGuru because of his highest degree in astrology , connection with Mahamayi and relations with the Jaipur and Udaypur royal family. Shri Sharma has been guiding and advising people for more than 20 years as a social service and many people have been benefited from his deep experience and profound scientific knowledge of Jyotish and Tantra . He is also an expert on remedial measures in various matters like service, business, career, marriage, politics, matchmaking, progeny, education, sickness, dosha nivaran, black magic removal etc. The art of prediction is a skill that a Jyotishi must develop over many years of training and practice and it is also dependent on the natural inborn talents of the individual. But the intuition is the only thing that enables the skilled astrologer to see the past, present and into the future. After living in discipline of sadhana for long, he got the intuition power and blessings of Goddess. This spiritual wisdom allows him to make strategies, solutions and actions with precison.